Well all good things must come to an end and today is our last day ‘on the Wallaby’. Tomorrow we will be home again in the afternoon. Would love to keep going but must also attend to things at home and start planning for the next big trip. Caravanning has been fun and we have been quite comfortable along the way considering we have gone to the tropics then down to winter. It certainly hasn’t dampened our enthusiasm to travel and there is so much to see and do. It’s great to be a ‘Grey Nomad’. 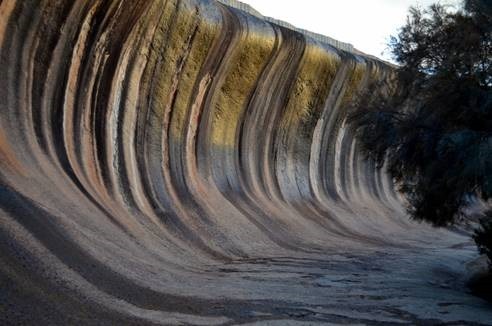 Today we stayed at Wave Rock. The rain has been hanging around but the sun has managed to put in an appearance. 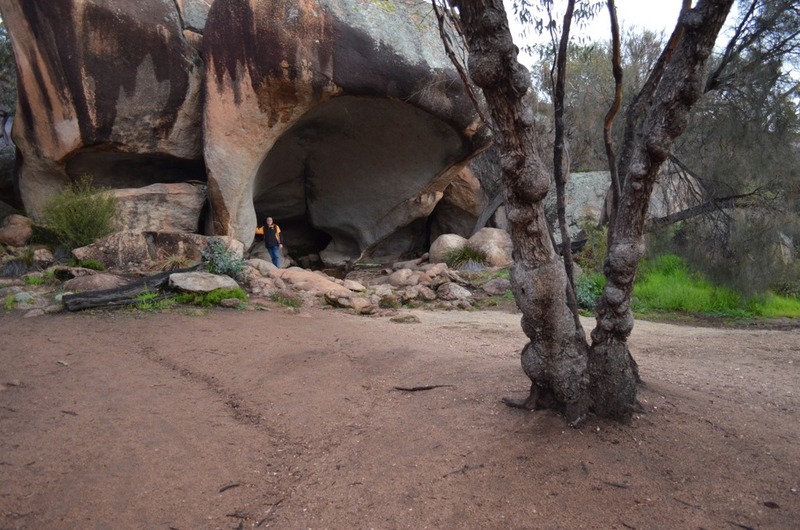 Eighteen kilometres from Wave Rock is the Humps and Mulka’s Cave. The rain held off for us to take a trip out there. 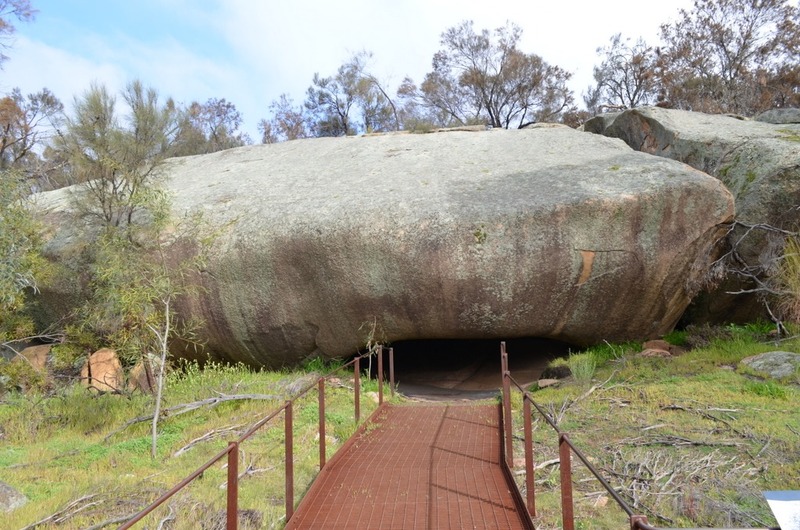 The Humps is another giant granite outcrop with its best known feature being Mulka’s Cave. The Mulka legend is that Mulka was the illegal son of a woman who fell in love with a man with whom marriage was forbidden. It was believed that as a result of breaking these rules she bore a son with cross eyes. Even though he grew to be an outstandingly strong man of colossal height, his crossed eyes prevented him from aiming a spear accurately and becoming a successful hunter. Out of frustration, Mulka turned to catching and eating human children., and became a terror of the district. 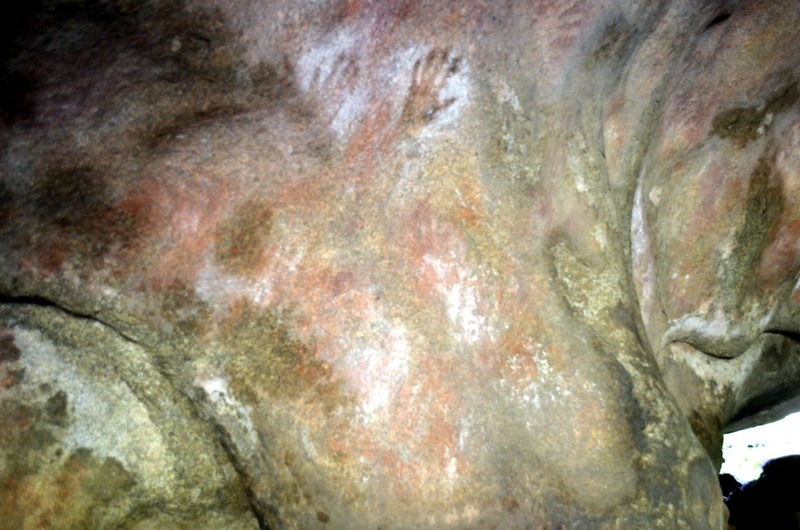 It was said he lived in Mulka’s Cave, where the imprints of his hands can still be seen, much higher than an ordinary man. His mother became increasingly concerned about Mulka, and when she scolded him for his anti-social behaviour he turned on her and killed her. This disgraced him even more and he fled his cave, heading south. All the aboriginal people of the district outraged by Mulka’s behaviour set out to track down the man who had flouted all the rules. They finally caught him near Dumbleyung 156km south west of Hyden where they speared him. He did not deserve a ritual burial and was left to the ants where he lay. A grim warning to those who break the law. 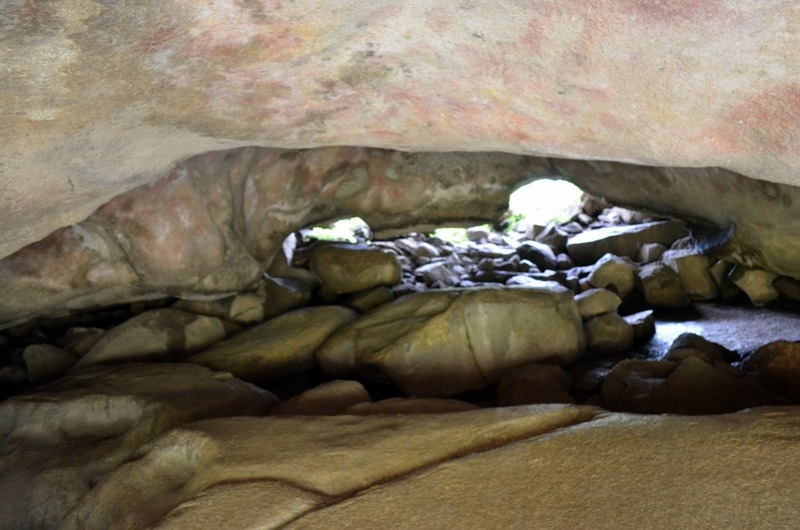 Leaving the cave, we traversed the Kalari Track that takes you up on to the rock face of the Humps. 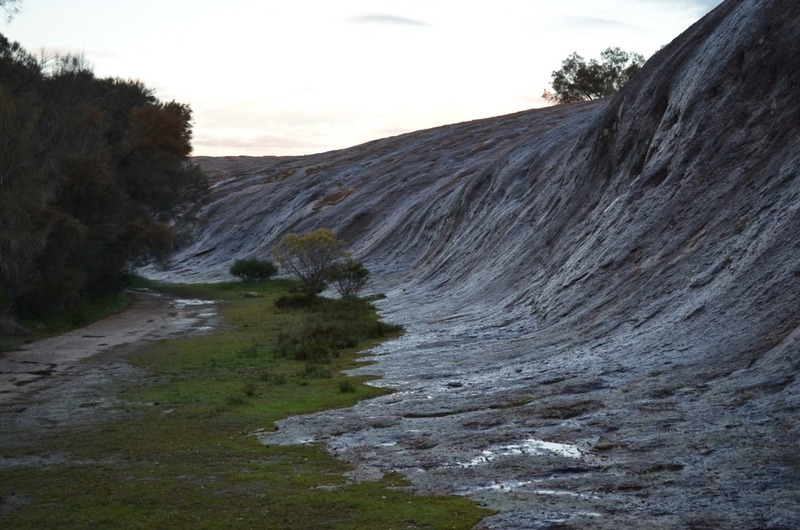 The track takes up one side of a granite valley where water gently flows in trickles down the sides. It the crosses to the other side and leads up to the peak of the rock formation. It is quite a climb and I’m so proud that a couple of old farts like us could make it to the top. Please don’t make us go up Uluru. It was a fascinating trek with360⁰ views of the surrounding farm lands and the many different rock formations and plants. Towards sunset we again set off for the short flat walk from Wave Rock to the Hippo’s Yawn. This was a lovely walk allowing us to stretch some of those muscles we used this morning. The fading sun and the water trickling down the rock faces gave us such a great feeling to be out and about. The air was perfumed with the fresh rain, the damp earth and sheoaks at the bottom of the cliff faces. 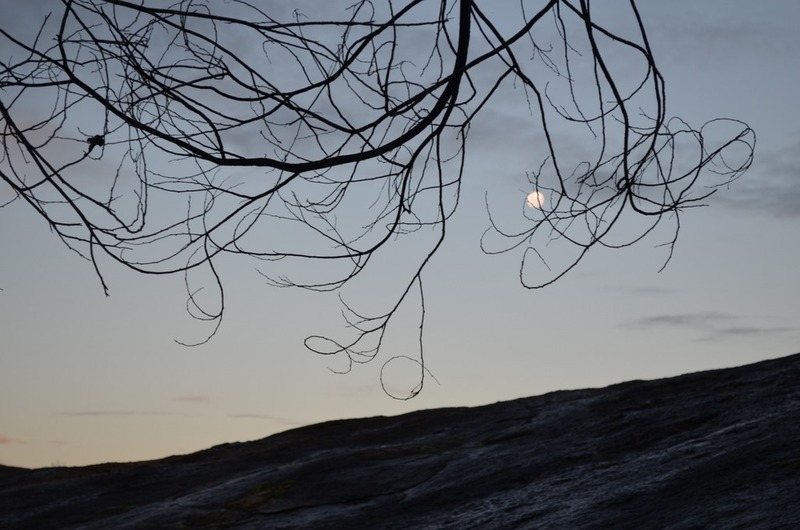 Once again I manage to get a few photos of the rocks and tried to capture the moon rising as well. It was certainly a great way to end our days on the road. Tomorrow should be an easy 330km drive home and the good thing is we don’t even have to go through the city. 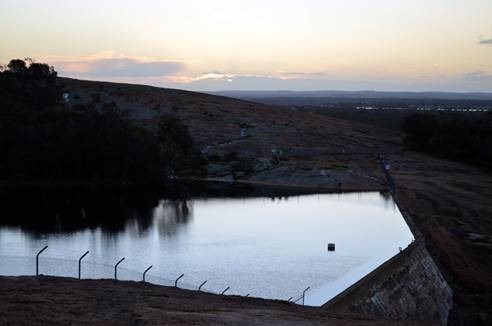 We just turn down the little road that passes Churchmans Brook Dam and in the front gate to a warm greeting from the dogs if they still love us. 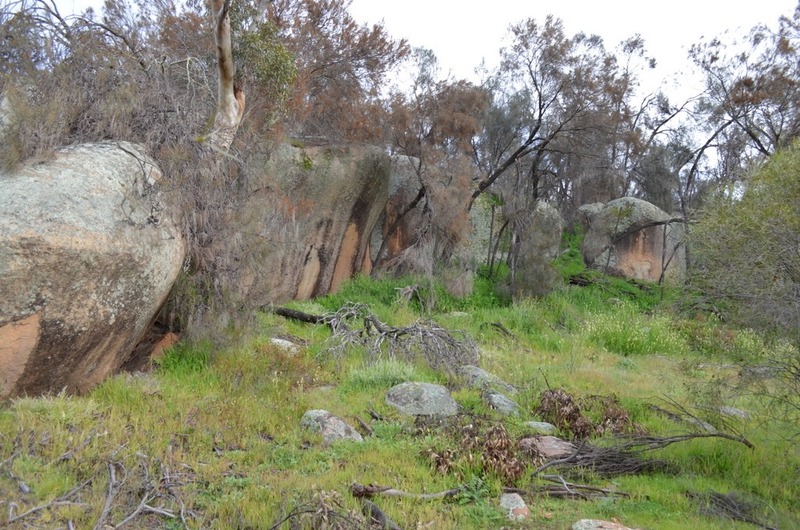 I didn’t put up some great photo and place around Esperance. I will do this as soon as I get home as it put on a great display of beaches and sunshine, there was also some wonderful people there being very innovative. After two beautiful days in Esperance and the threat of rain it was time to move on. Rain did come overnight and looked like it would continue all day. We again headed west into the rain which was steady, after about 100km blue holes started to appear in the clouds, before long the rain had all but disappeared but the clouds persisted. We managed to make Ravensthorpe just before noon as Ravensthorpe closes at noon on Sundays. Turning north towards Hyden we watched as black clouds gathered to the north directly in our path. The wind was coming from the north west pushing the clouds east and with the road tracking further to the north west we managed to escape any further deluge and even managed some sunshine. 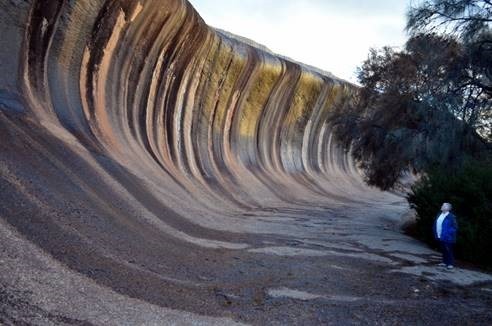 We made Wave Rock in good time and setup camp in the caravan park. 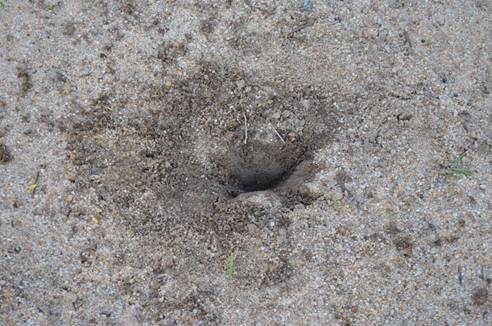 I noticed some small holes dug in the ground with scratching around them but couldn’t work out what made them. Looking around I noticed a flock of galahs (pink n greys for West Australians) they were busily digging up grass shoots. Towards sunset we headed to Wave Rock which is just at the end of the caravan park. We had certainly picked the right day and time to come as the sun lit up the rock face in its dying stages, the rock face displaying it many colours enhanced by the trickles of water flowing from above. We managed to climb to the top as the sun was setting and still be able to see across the countryside. 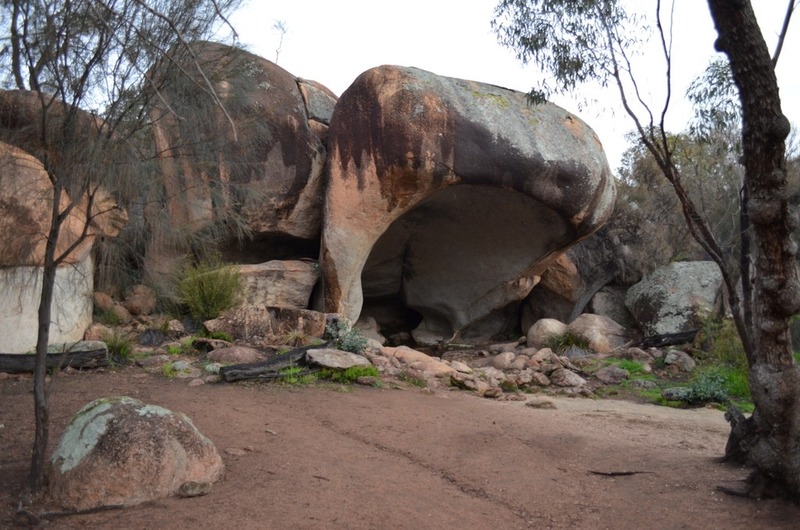 I didn’t know that the western end of Wave Rock along with Hyden Rock had been dammed in the 1920s to provide water to the township and a supply for the steam railway. 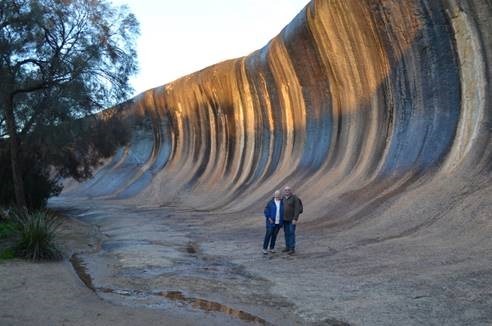 Tomorrow we will visit the other natural wonders around the area before heading for home on Tuesday. Yes, we made it back across the border into W.A. at 15:00 SA time, 13:30 WA time and 14:15 local time as they are a law unto themselves here. They like to confuse the hell out of the tourists who don’t know if they are coming or going. When they arrive at the border and the Agr Police who want to look in every crevice of the car to see if they have any contraband. One tourist asked the inspector if he knew anything about Karijini to which the reply was “Gee I don’t know. Never heard of it. Don’t know where it is.” The Inspector we had was very polite and gave us a chip box to replace the fruit box I was using for bits ‘n’ pieces in the ute. Another thing dropped off the bucket list today but I think it might just stay on it. We stopped at the Head of the Bight to see the whales. There was a sign at Ceduna Tourist Office stating 8 whales seen at Fowlers Bay and 99 at Head of the Bight. With this in mind we made sure we took the turnoff just east of Nullarbor Roadhouse. 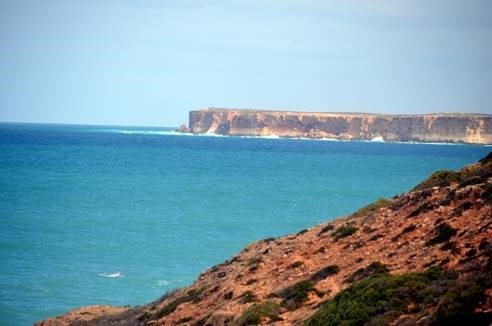 The Aboriginal Lands Trust have a visitors centre setup at the Head of the Bight and charge a small fee to access the cliff top to view the whales. 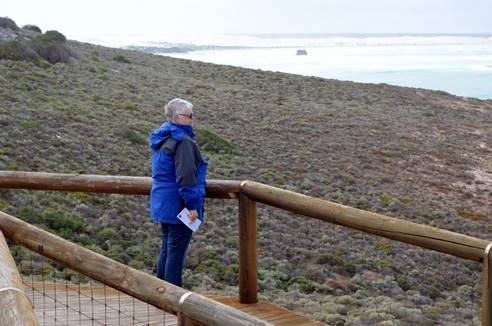 The Southern Right Whales breed from May to October in this area so we were there at the right time. The female whales generally breed once every 3 years and bear calves that are about 5.5m long and 1000-1500 kg at birth. Females feed and nurture their young in the shallows where they can best protect them from predators such as the Killer Whale or the Great White Shark. We managed to see probably a dozen females mostly with calves. They seemed to be having a great time while we stood by in the chilly wind watching and trying to photograph them.